A study from Plymouth University has demonstrated that when electrical signals are transmitted through graphene at high frequencies, they do not lose any of their energy. 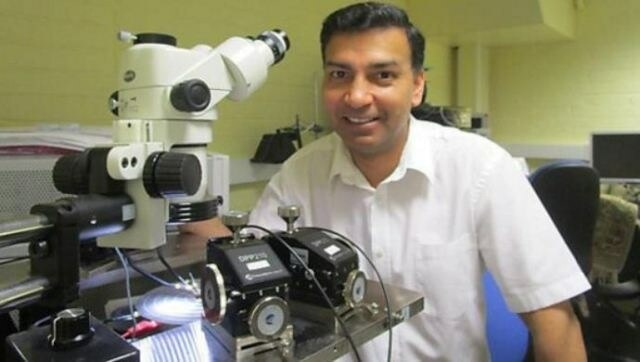 Dr Awan (pictured right) uses a Cascade probe station and Keysight Parameter Analyser in the Wolfson Nanomaterials and Devices Laboratory in Plymouth. Graphene, dubbed a ‘wonder material,’ was discovered in 2004. The one-atom-thick material exhibits strength 100 times more than that of steel, making it a potential candidate for a wide range of applications in the fields of engineering and health care. This study has demonstrated that graphene transfers high frequency electrical signals, without causing any additional loss in energy in comparison with direct current, outperforming materials including superconductors. As graphene does not have a band-gap, which permits electrical signals to be turned on and off with the help of silicon in digital electronics, researchers anticipate a number of potential applications for this nanomaterial, ranging from ultra-sensitive biological sensors to advanced high-speed transistors and amplifiers for satellite communications and mobile phones. Dr Shakil Awan, a Lecturer in the School of Computing, Electronics and Mathematics at Plymouth University, was the leader of the study. Researchers from Cambridge and Tohoku (Japan) Universities and Nokia Technologies (Cambridge, the UK) also contributed to the study. An accurate understanding of the electromagnetic properties of graphene over a broad range of frequencies (from direct current to over 10 GHz) has been an important quest for several groups around the world. Initial measurements gave conflicting results with theory because graphene’s intrinsic properties are often masked by much larger interfering signals from the supporting substrate, metallic contacts and measurement probes. Our results for the first time not only confirm the theoretical properties of graphene but also open up many new applications of the material in high-speed electronics and bio-sensing. EU Graphene Flagship, EPSRC, ERC and Nokia Technologies funded the study. The study results, reported in IOP 2D Materials, are now being used to develop high-speed and efficient low noise amplifiers, radiation detectors, mixers, and novel bio-sensors. Graphene is perfectly suitable for this application, because its thermal noise at room temperature is lower than any other materials. This enables sensitive detection of interactions of antibodies and antigens present in small numbers, which in turn helps to indicate the possibility of a patient to be affected by dementia in the future. Graphene devices for next generation wireless technologies (up to and beyond 10 GHz) are progressing fast. Our study has unlocked the fundamental behaviour of graphene at high frequencies, which will be essential in the design and evaluation of future graphene-based wireless devices. This has only been made possible because of the multi-discipline expertise of the different groups based at Nokia, and in Plymouth, Cambridge and Tohoku universities.